On January 29, 1927, Edward Abbey was born in Home, Pennsylvania. Abbey became one of the most influential and controversial environmentalists of the 20th century. 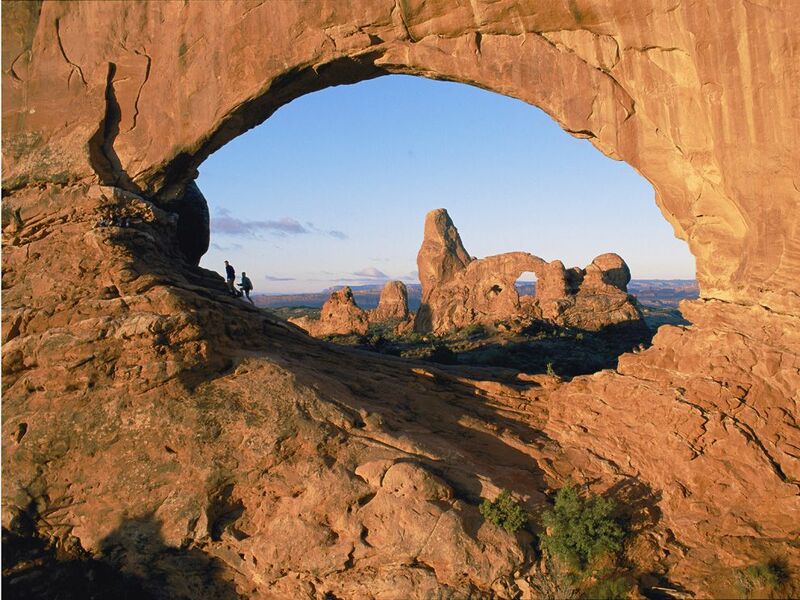 South Window Arch, part of Arches National Park, Utah, frames Turret Arch. Hikers on the left put the enormous, erosion-carved arches in perspective! Although Edward Abbey worked at 16 national parks, Arches National Park is most associated with the controversial environmentalist. His time working as ranger in Arches inspired his collection of essays, Desert Solitare: A Season in the Wilderness. The environment and habitats of the American Southwest captivated Abbey during a trip he took after high school. He went on to work as a park ranger in such diverse landscapes as Organ Pipe Cactus National Monument, Arizona; Glacier National Park, Montana; Everglades National Park, Florida; Lassen Volcanic National Park, California; and Arches National Park, Utah. His experiences in the isolated desert of Arches inspired Abbey’s collection of essays, Desert Solitare. Abbey was passionate in his support for national parks, but increasingly critical of their management. He opposed industrial development and the park service’s reliance on cars and technology-based tourism. This criticism inspired Abbey’s novel The Monkey Wrench Gang. The misfit “gang” uses illegal, nonviolent acts of sabotage to prevent industrial development of wilderness areas. The title is taken from a character throwing a wrench into a moving piece of machinery to stop it from working. The Monkey Wrench Gang was enormously influential among radical environmentalists, inspiring groups to disable industrial equipment, block roadways, and graffiti tools and machinery used to develop wilderness areas. (One of Abbey’s popular quotes is “Keep America Beautiful—Burn a Billboard!”) Such “monkeywrenching” acts of sabotage can result in economic and physical damage to property, and even threaten people’s lives. For these reasons, the controversial term “eco-terrorism” is sometimes used to refer to some radical environmentalists. to weaken or make useless. short piece of prose, usually nonfiction and on a specific topic. (singular: graffito) writings or drawings that have been illegally scribbled, scratched, or sprayed in a public space. action aimed at weakening, destroying, or delaying an action or set of initiatives. use of violence and threats of violence to influence political decisions.